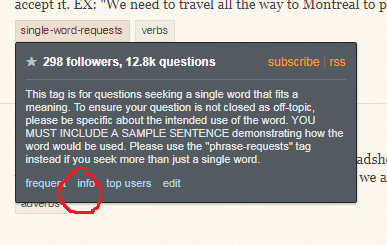 Have the info pages been introduced recently? (or have I failed to see them so far?). So it predates the site by two weeks. This site—and its Community user—were created on 2010-08-05. Meta Stack Overflow: Should tag wikis get more exposure? That one is over six years old. It's now at revision 17. Perhaps that "info" link needs to be re-worded. I don't know why it's not "more info". Why do we need an irony tag? Why am I getting 2 types of web pages (design-wise) on ELU?